Well, the tides sure turned quickly. USC didn’t appear to gain any momentum from their upset over Arizona State Wednesday, and fell 96-70 to the rival Bruins in the Pac-12 Quarterfinals. The Trojans finish the season at 12-20 overall, and 3-13 in Pac-12 play. The Trojans were in the game for the first ten minutes or so before a 14-0 run turned a 13-10 USC lead into a 24-13 deficit that only ballooned as the game went on. Katin Reinhardt led USC with 20 points, while Nikola Jovanovic added 17 points and six rebounds. UCLA guard Isaac Hamilton was an unstoppable force on offense, notching a career-high 36 points on 13-of-17 shooting. What did we learn from USC’s season finale? The Trojans weren’t able to stop UCLA in the two schools’ first two meetings, and Thursday’s game was no exception. 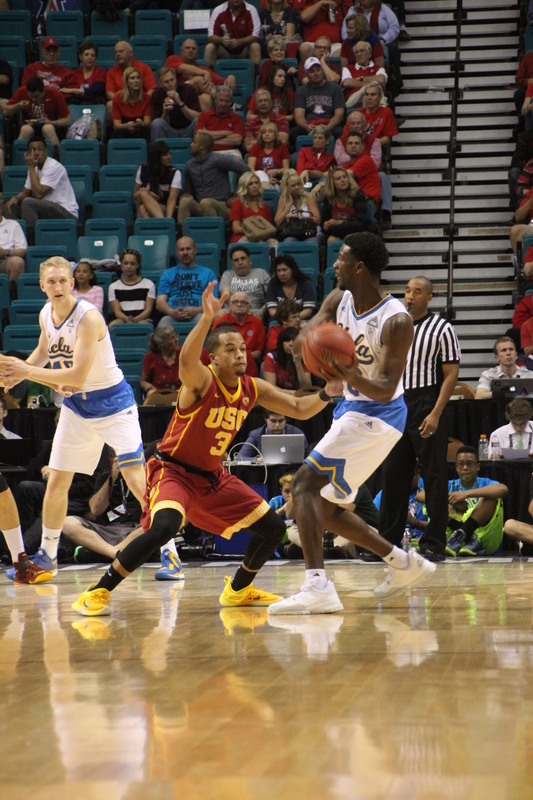 After a slow start allowed USC to take the lead seven minutes in, four Bruin three-pointers in four minutes gave UCLA a 13-point lead they never relinquished. Even as the Trojans started the second half 5-of-6 from the field to tare UCLA’s lead to 13 with 15:49 left, nine points in less than three minutes from Hamilton pushed the lead over 20. The Bruins finished with 96 points on 60.3 percent shooting, and went 12-of-20 (60 percent) on three-pointers. This came after USC held its last five opponents to 37.5 percent shooting from the field. Hamilton had a career game with 36, and Reinhardt knew that he and his teammates ultimately couldn’t get it done against the UCLA sophomore. “We tried to do our best job guarding him, and he was in a rhythm tonight, and we just couldn’t stop it,” Reinhardt said. There wasn’t a lot of action in the paint due to the Bruins’ perimeter dominance, but UCLA’s center Tony Parker had 14 points on 7-of-11 shooting. Andy Enfield is well aware of the issue, and said he wants multiple players to gain weight this offseason in order to compete against the strong, veteran teams in the Pac-12. After losing starting point guard Jordan McLaughlin to shoulder injury for the last eight games, Enfield admitted that USC’s other point guard, Julian Jacobs, hurt his hand and played hurt for the season’s final two weeks. It was noticeable in the two Pac-12 Tournament games, where Jacobs missed all three of his free throws and took mostly layups and one-handed runners. The sophomore point guard really steeped up in McLaughlin’s absence, averaging 34.5 minutes and 6.9 assists per game as USC’s main ball-handler. “I didn’t say anything because I don’t want to make excuses,” Enfield said. 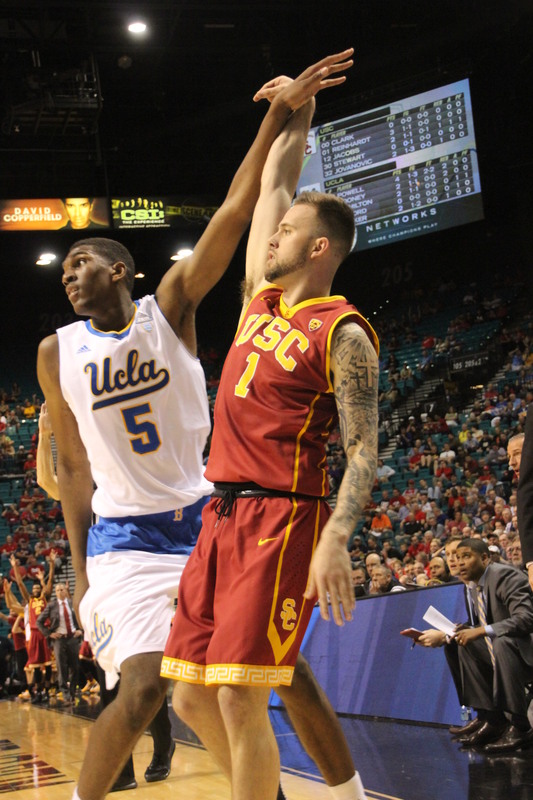 The offseason will be a time of healing for the USC backcourt, with McLaughlin having shoulder injury. Forward Strahinja “Luis” Gavrilovic also missed the Pac-12 Tournament with a torn labrum, though it’s unsure if it will require surgery. Katin Reinhardt had the best performance of any Trojan on Thursday. The sophomore had 20 points on 7-of-11 shooting, hitting 5-of-9 three-pointers. He had a pair of threes early to allow USC to keep with the Bruins in the early going, and avoided the low-percentage jumpers he’s oft to take. Reinhardt had 22 points last week against the Bruins to boot. The Trojans lost to UCLA by an average of 18 points in three contests this season, but Reinhardt averaged 17.3 points against the Bruins. The Trojans shot 46.2 percent in the first half, yet found themselves in an 18-point hole at halftime. Why? Thirteen first-half turnovers by the Trojans, which turned into 18 UCLA points. The Trojans calmed down in the second half with only 5 giveaways, but giving the potent Bruins offense chance after chance eliminated any chance of USC replicating a late-game run like it pulled off against Arizona State. 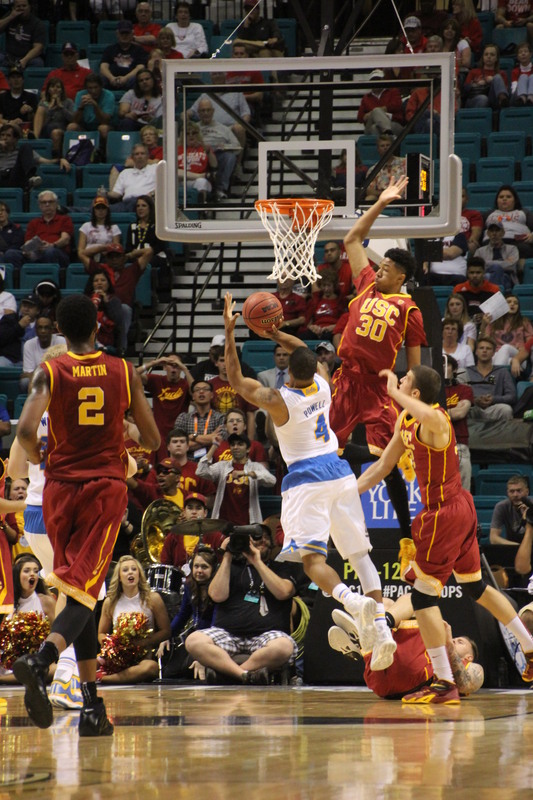 Elijah Stewart tries to block a shot by UCLA’s Norman Powell (Photo by Josh Faskowitz). There’s little doubt Andy Enfield will be around for a third season at USC. His overall record isn’t pretty, but February and March really showed that his system is coming into place. The Trojans return everyone on the roster next year and add 6-foot-10 forwards Bennie Boatwright and Chimezie Metu. The Trojans’ performance will have to rise to expectations of a postseason berth, as a third straight losing record probably won’t cut it for Enfield. The 2014-15 campaign wasn’t always pretty, but USC Men’s Basketball should be a team worth watching come next fall. We’ll be following the team all offseason, and thank you all for your loyal readership and support this year. Until next year! I was almost lulled into believing that Opie could coach after watching them beat Arizona St. But then reality set in and another MISERABLE loss to the bruins. Opie better get lots of sun in the off season because the “HEAT” will definitely be on next season. If next year starts off the way this one ended, when do you stop the “bleeding” and pull the plug? Haden better be thinking about that as well. and start thinking about coaches that can fix this mess. I feel sorry for the kids because they have been close, but they have not been able to finish. OPIE IS NOT THE ANSWER. clearly next year is nake or break. There was sone good and bad this year. Turnovers defensive lapses poor shooting poor free throw shooting and poor rebounding all plagued usc at one time or another and some often. Reinhardt was terribly erratic. Need the veteran to be consistent. Need to see more go through Jovanovic. Need a go to scorer and a consistent outside threat. Steeart had flashes of brilliance. Boatright looks like he can be a scoring machine. Need to get Jacobs and Jordan to figure out how to be on court together. Need better defense whether zone or man. I pray the guys shoot to make at least 50 free throws a day. Every day.